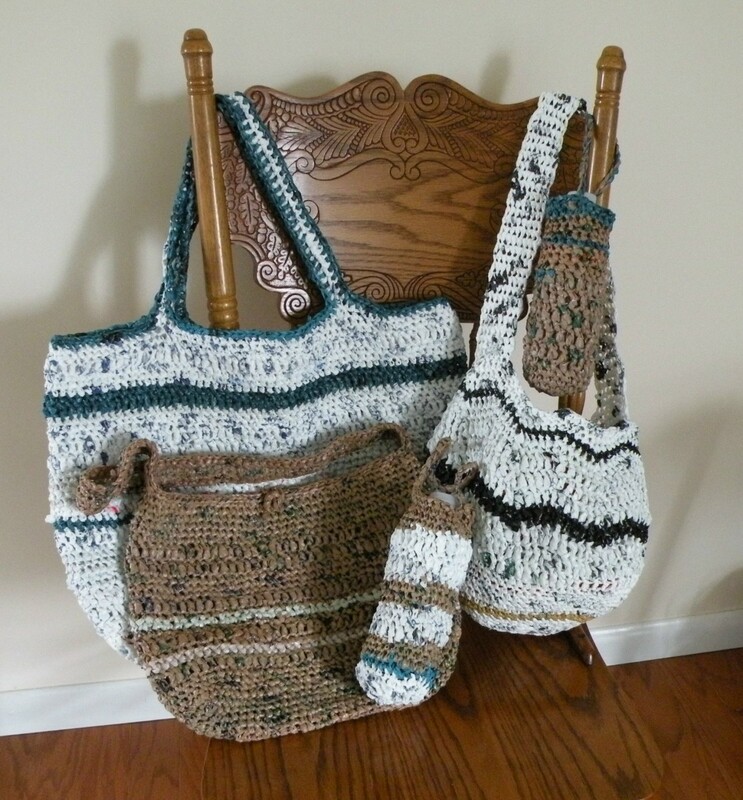 Marla is a self-employed entrepreneur, a tinkerer, and classic over-thinker. If the humble mason jar has taught us anything, it's that glass jars have an infinite number of uses. For this reason, I've always had a hard time throwing away empty glass food containers or candle jars. Making old glass jars into coin banks is something I've always wanted to do. 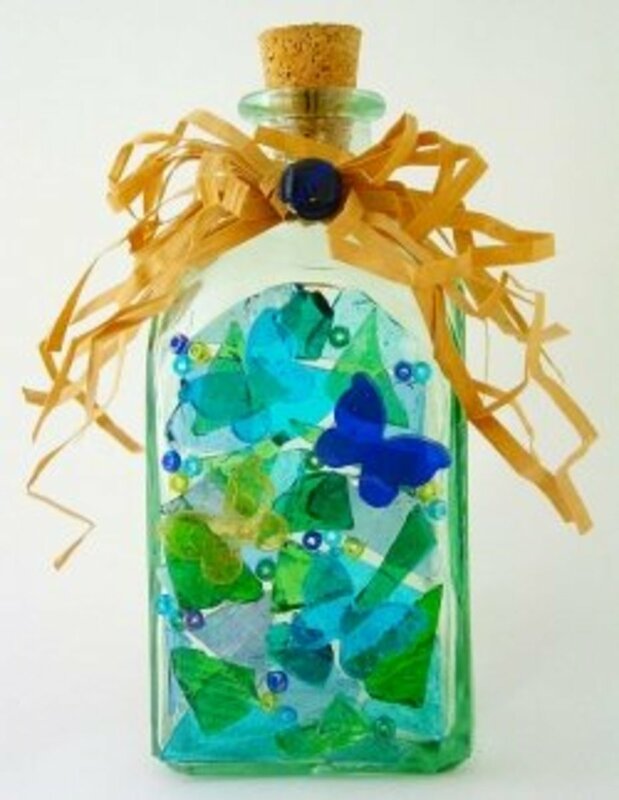 By upcycling glass jars in this way, I feel like the jar has a much more functional purpose and would stay out of the waste stream much longer. 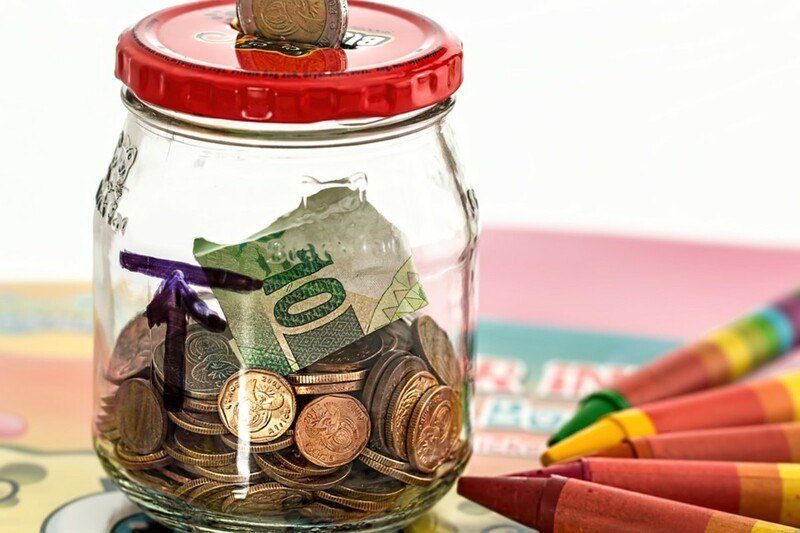 Not only that, most ceramic and metal piggy banks on the market are just plain annoying when it comes time to take money out. 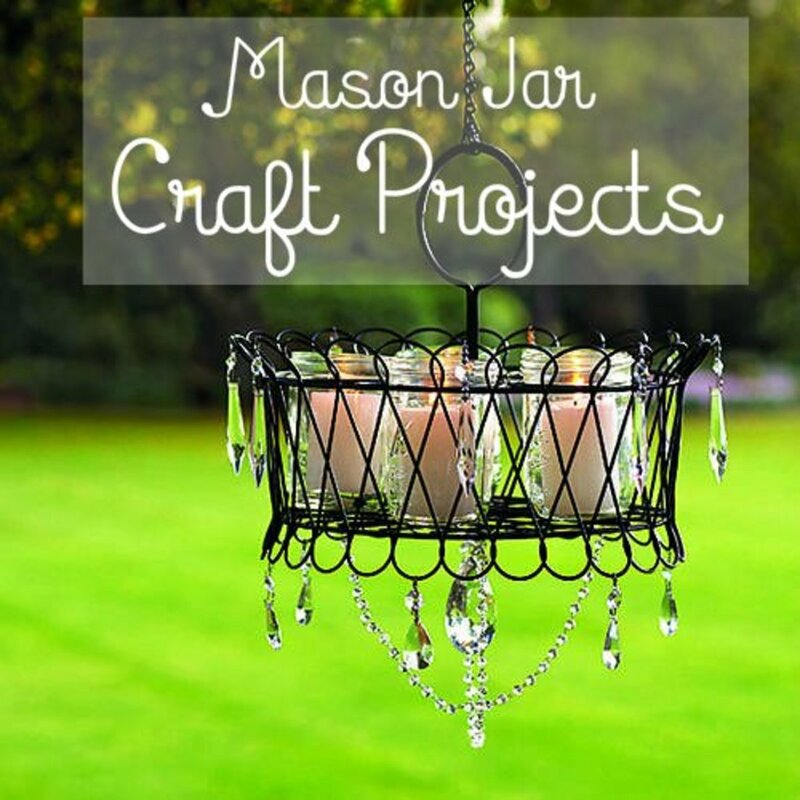 Coin banks upcycled from glass jars are fun to make and incredibly useful. 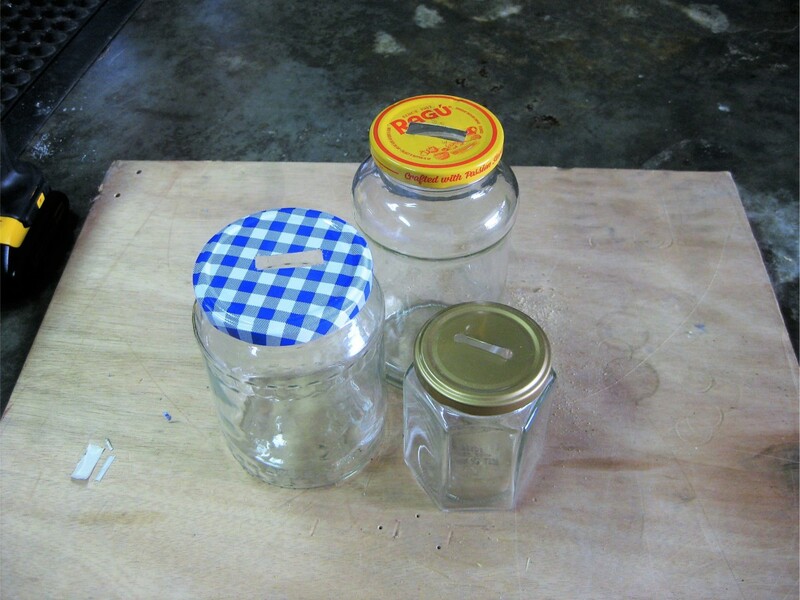 It's easy to find slotted lids for Mason jars, but it is important to try and recycle existing glass jars. I have been looking for an affordable and efficient way to punch rectangle slots in metal lids for some time now, but had a hard time finding the right configuration of tools. I have been tinkering with this for a while and have made some progress, so I decided to make a tutorial that maybe others can improve on. One cool thing I have figured out is that people are usually very enthusiastic about saving their glass jars for you. 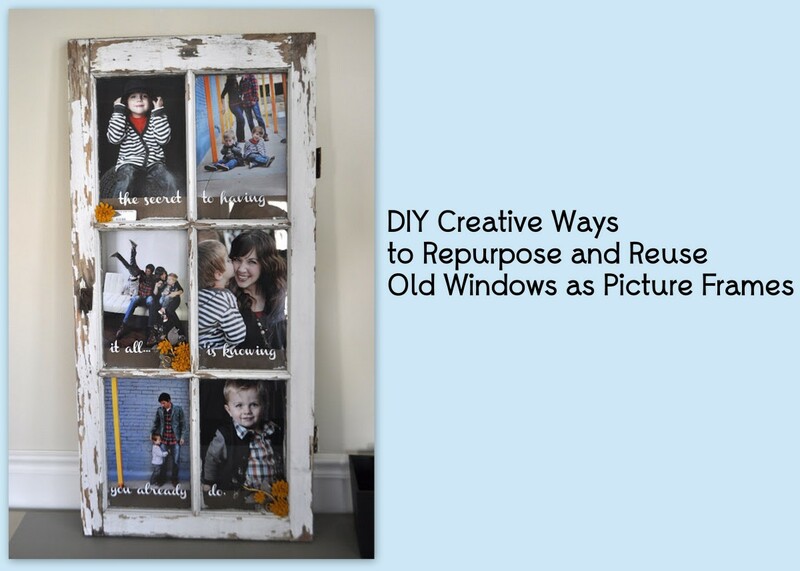 Most people will happily give you their old glass jars because they don't want to throw them away either. 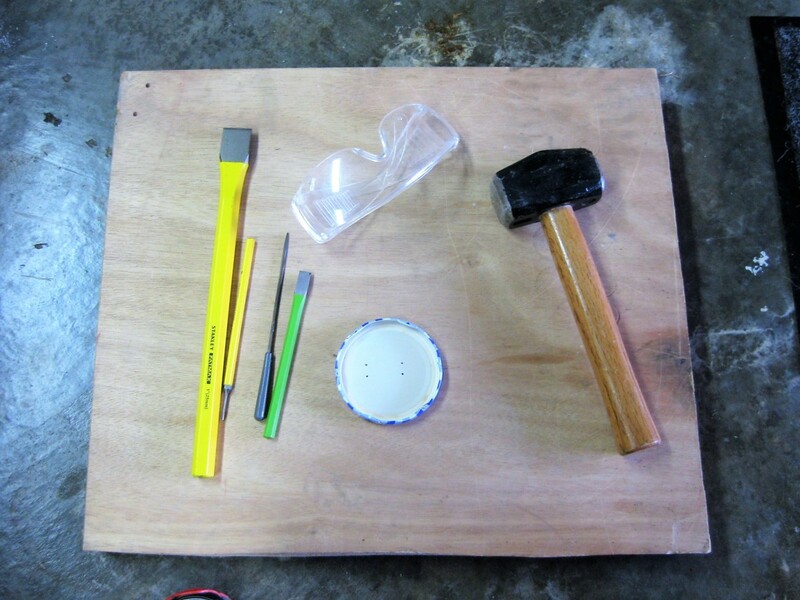 Basic hand tools required to punch slots in metal lids. 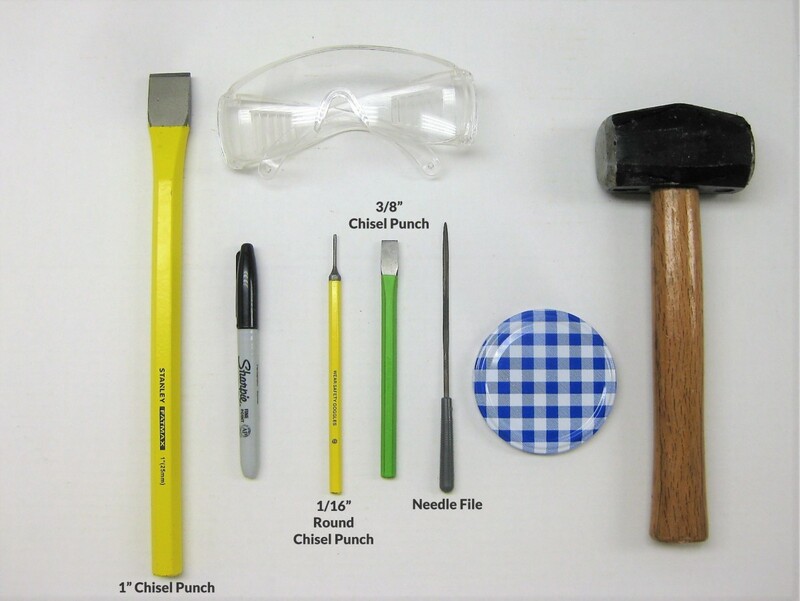 The size of the chisel punches can be adjusted to suit the size and shape of the hole you want to make in the lid. 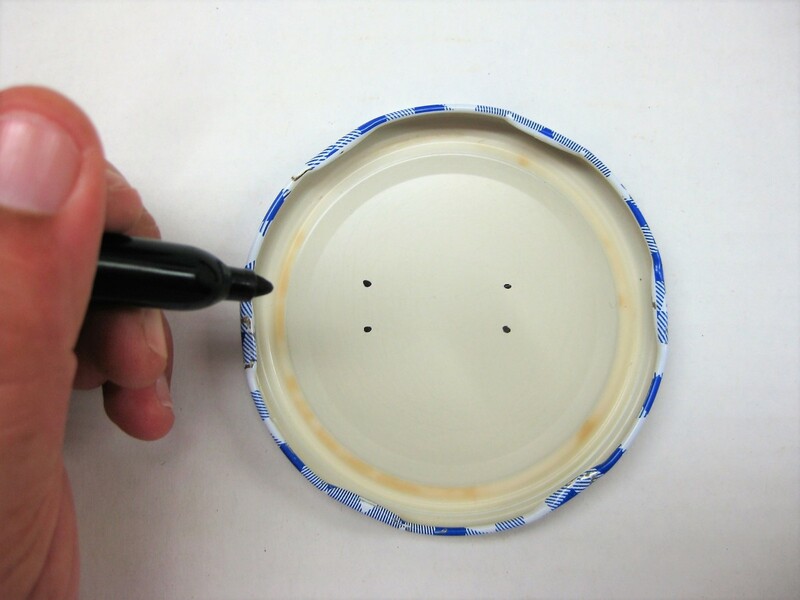 Since you're working with a circle, it may be hard to find center on the inside of the lid. You may want to make a template on paper and cut it out so you can easily find where you will be cutting. 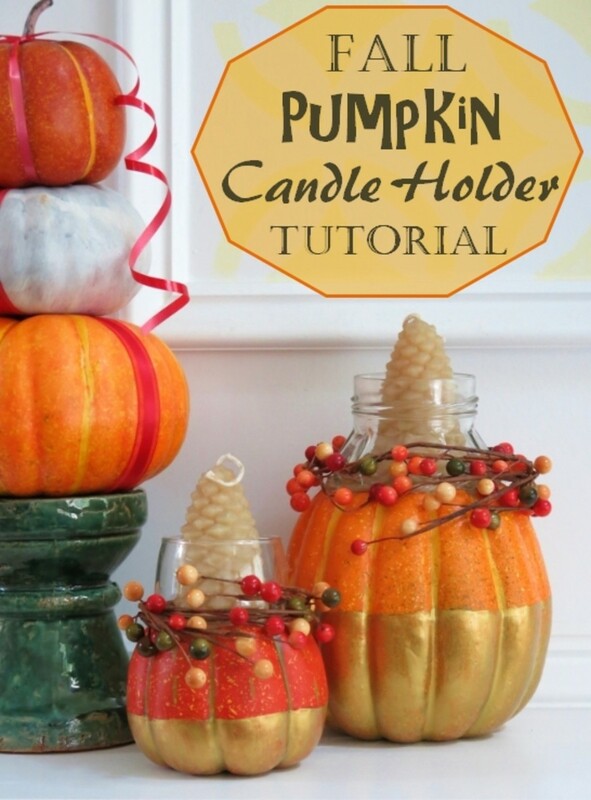 This tutorial is ideal if you plan on decorating the lid after punching a hole in it. 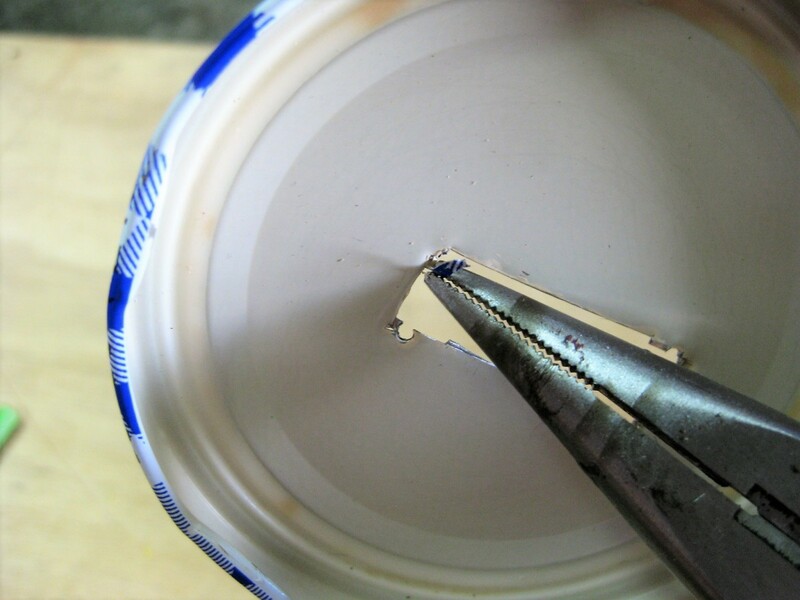 The paint does have a tendency to chip off around the edges you cut. Some food containers have lids that are a little more difficult to clean (ex: spaghetti sauce containers or pickle jars). To clean those, sprinkle with baking soda and add a little water, enough to form a paste. Let it sit for a while. Then come back and scrub it down really good. If you just use soap and water the scent will likely still linger. I typically purchase my needle files and chisel punches in sets on Amazon so I have a variety of sizes to work with, but you can buy them individually at just about any hardware store. Place whatever hard surface you are using as a buffer on a sturdy work bench or table. You don't want it to wobble or shift while you work. Our workbench was full on the day I took pictures for this tutorial, so I had to work in the floor. I used a piece of a solid core interior door for my work surface. 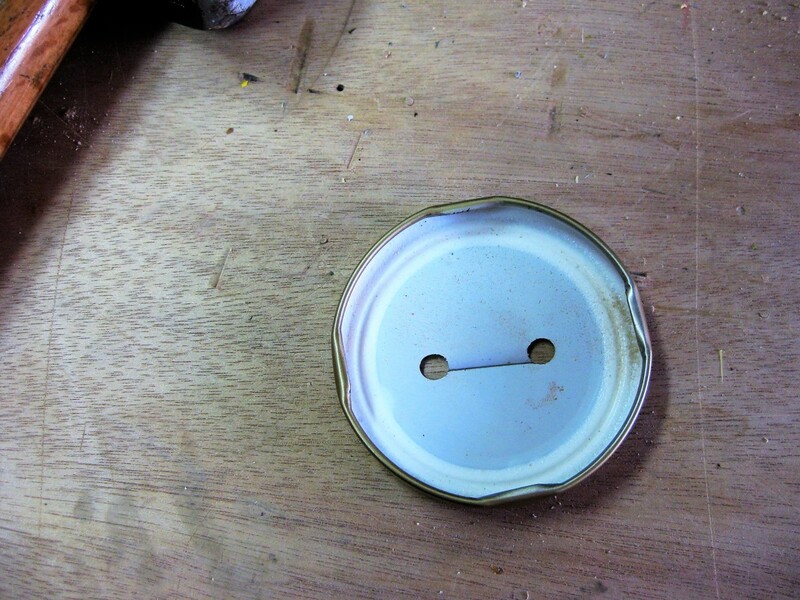 Place your metal lid flat side down and mark the corners of the shape you want to cut. If you're confident you can freehand it. I put dots where I wanted the corners to be. I freehanded it so it is off center, but you get the idea! Using the small 1/16" round punch, punch out the corners of the shape you are cutting. Place the chisel on the corner, pushing down with a firm grip. Strike with your sledge hammer. This punch goes through really easy so you will not need to wack it very hard. If you wail on it, it will get stuck in the wood below and it's kind of a pain to pry back out. Punching out the corners with 1/16" round chisel punch. After your corners are punched out, grab your 1" straight edge chisel and line it up with the dots before hitting with sledge hammer. You'll want to position the chisel at the top and outside of the dots. If you position it below, you will still be able to see the round punches when complete. Do the top and bottom horizontally. Try to keep your lines straight. Using the same method as before, hold chisel firmly and hit it with the sledge hammer. You will likely need to use some force and may need to hit it a few times. Make sure you are wearing your safety glasses for this step! The friction and force may cause little bits of metal to go flying and they can be a little hot. Line up 1" straight edge punch to the outside of one corner. Punch out a line that connects to the opposite corner. Using the 3/8" Straight Edge punch, line up your vertical marks and hit with sledge hammer using the same technique as in previous steps. Cutting vertical lines with 3/8" straight edge chisel punch. After hammering, give the lid a second too cool off as it may be hot to the touch. After it is cool, pick it up to see if your cuts went all the way through. Chances are there may be some sections still attached to the lid but you should be able to wiggle them free without much trouble. Be careful when working around the edges, they will be sharp! You may even want to use gloves. If the punch will not wiggle free you can strike it again with the appropriate length chisel or enlist the help of a pair of pliers. You can remove stubborn pieces with a pair of needle nose pliers by wiggling back and forth until it breaks free. The edges will be sharp, sharp sharp! You will want to take a needle file and clean up the rough edges. 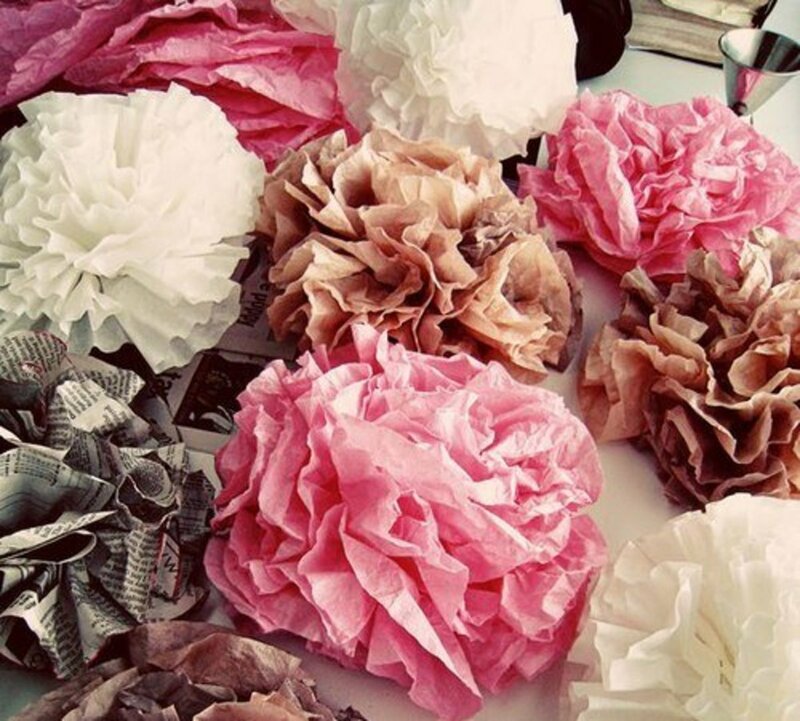 I always decorate my lid with decoupage paper or fabric so these edges will be covered, but it's still a good idea to smooth them up best you can. This is easier to do if you put the lid back on the jar it goes with. You can move the needle file up and down and get to it at better angles than if it is in your hand--and it's also safer. Just be sure not to hit the glass with the file or it could break. You may also need to flatten everything back out. 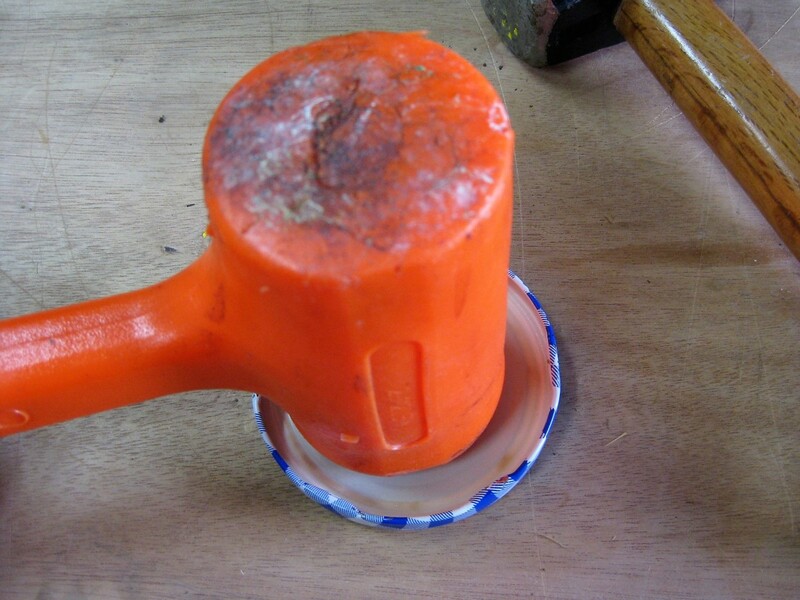 Just put your lid back down and hammer lightly with the rubber mallet to get everything flatter. 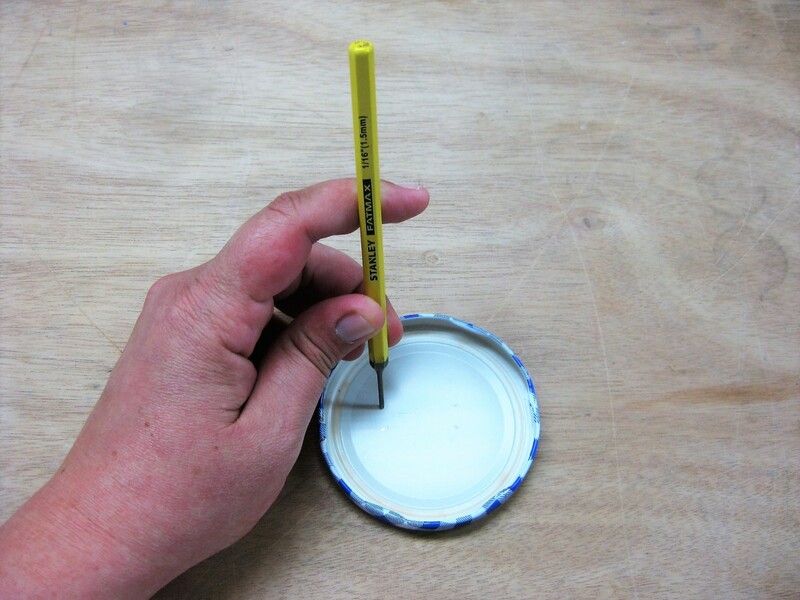 Tip: If lid is warped, you can use a rubber mallet to tap any bent edges down. Since I had to work in the floor for this tutorial, things did not go as smoothly as they normally do. I didn't get my lines straight or far enough to the outside of the corner punches because everything was sliding around. As you can see in the photo below, I did not position my straight lines correctly and you can still see the round corner punches (the blue and white lid). 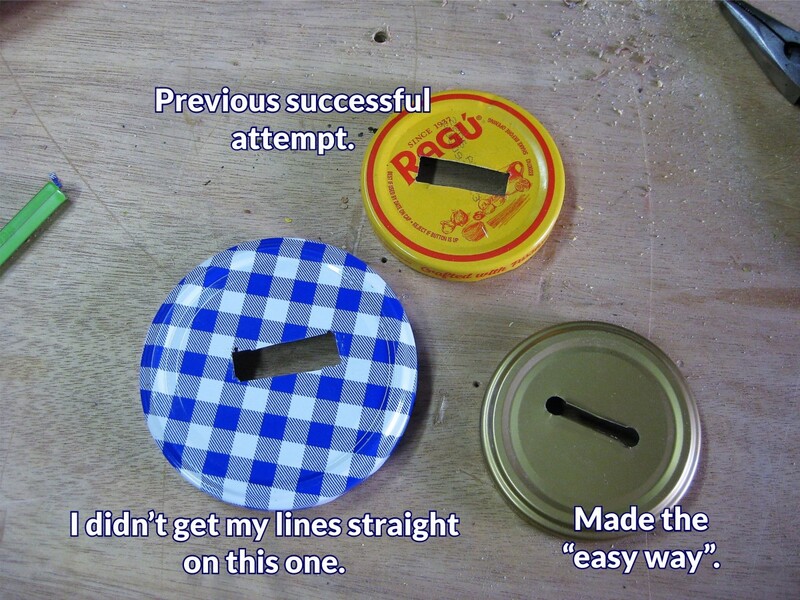 Luckily I had an example from a previous successful attempt, which is what it should look like (the Ragu lid). The gold lid on the bottom right was made using a slightly different (easier) method which is described below. If you have access to a drill and a large drill bit, you can eliminate the need for round chisel punches by just drilling 2 holes in the lid and connecting them with straight punches. My husband is using a step drill bit, but it isn't required. You can use any size drill bit you like. It just so happened the step drill bit is what he had handy at the time for demonstration. I wanted to show both ways of making slots because I know not everyone has a drill. 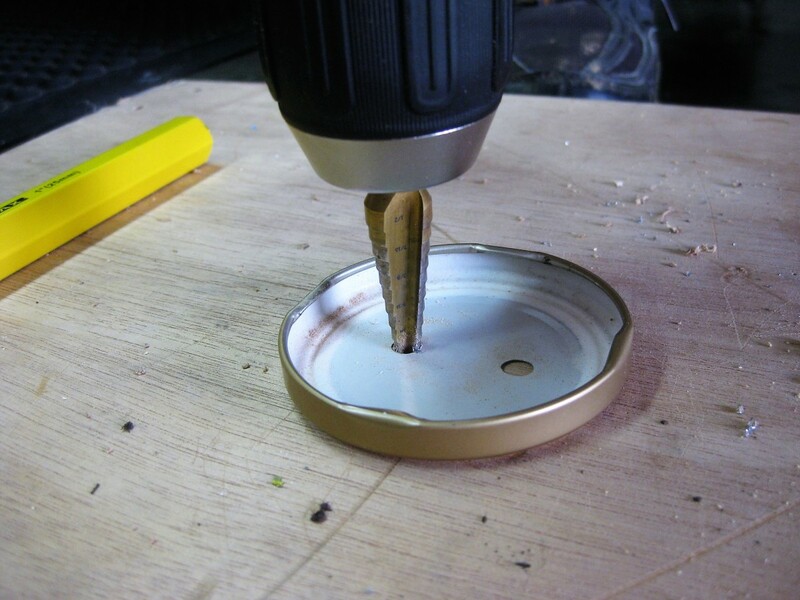 Drill two holes on outer edges of where you want slot to be. Connect the lines with straight punches. Done! Ready to be turned into coin banks, tip jars, or donation jars! Now the fun part begins! Decorate your new coin bank however you want! Decoupage, chalkboard paint, fabric, custom labels, ribbons, alcohol paint, glow in the dark paint, stencils...the possibilities are endless! While you're adding flair, just make sure not to paint around the lip of the glass jar or the threads on the inside of the jar lid. You can decorate around the punch, but not the threads. 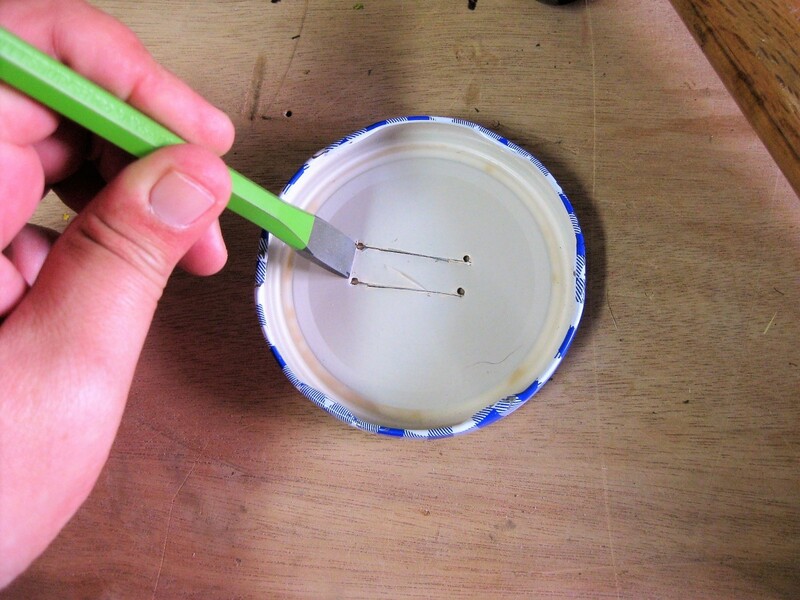 Even a thin layer of paint will make the jar difficult to open and close because the tolerance will be off. 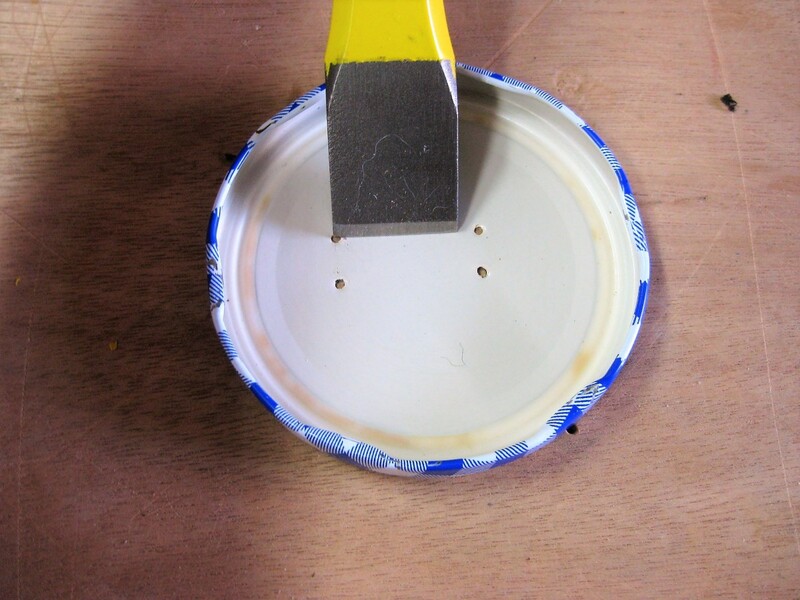 If you plan on painting the outside of the jar with acrylic paint, it is a good idea to rough up the surface a tiny bit using a high grit sandpaper to give the surface some tooth. After sanding, coat with a good primer and let it dry completely. You may even want to do 2 coats of primer. After painting, make sure to apply 1-2 coats of sealant. 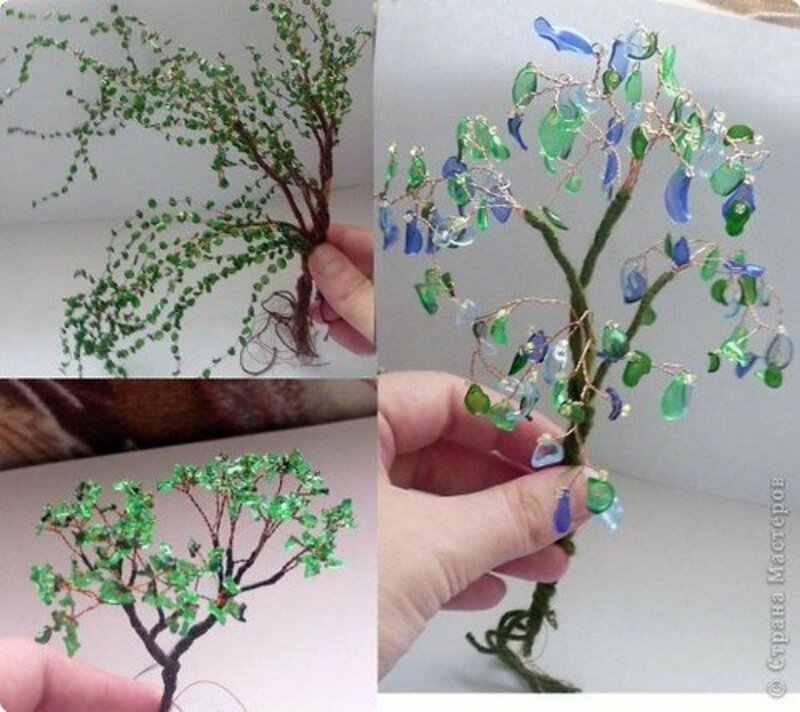 Glass is a non-porous surface so acrylic paint does not want to stick it, but if you prepare the surface and seal it, you shouldn't have any problems at all. Enamel paint is also a good choice. Americana Enamel paints in gloss finishes are my favorite to use on glass. If you try this tutorial, be sure to let me know in the comments below. I know the process isn't perfect, but it is a cost-effective option. 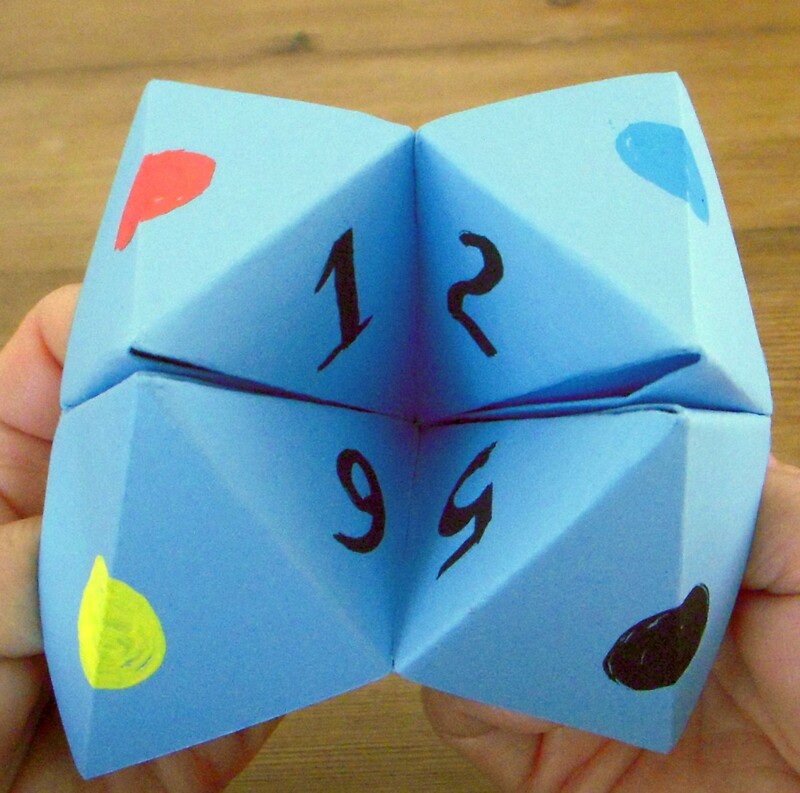 Just be careful around all the sharp edges and have fun!